This experiment looks at the temperature of two cups of water as they are frozen. One cup contains pure water whilst the other contains salt water. The experiment is ideal for demonstrating how salt depresses the freezing point of water. It is also a good introduction to the theories of latent heat. It is suitable for ages 16+ and requires some knowledge of the processes involved in state changes of liquids. If the freezer is more than 2 m away from the DrDAQ then you may also require one or more 5 m sensor extension cables (Part no EL032). Fill both cups with enough water to cover the temperature probe. Obviously the more water used the longer the experiment will take. Add salt a little at a time to one of the cups of water and stirred until it dissolves. Stop adding salt when the solution is saturated (ie salt will not dissolve). Mark the cup that has salt water so that it can be identified later. We placed both cups into a cardboard box with two cut out holes. This stops the water spilling and also provides some insulation. Put one temperature probe in each cup of water and secure in place with a rubber band around the cup. Ideally each probe should be in the middle of the cup and not touching the edges. Plug the probes into DrDAQ and run PicoLog software. Name one channel ‘Pure Water’ and the other ‘Salt Water’. Check that the temperature readings look sensible. Set up PicoLog to record one reading per minute. Place both cups into the freezer and shut the door being careful to feed the cables for the temperature sensor out the edge of the door without pulling the sensors out of the cups. 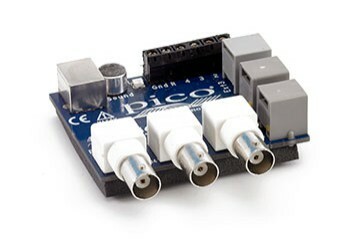 Start PicoLog collecting data and display both channels on a graph. Check that the temperature from both channels begins to decrease. Allow the experiment to continue until both temperatures have levelled off. In our freezer this happened at around –30 °C and took 5 hours. Note that, due to the action of the freezer thermostat, the temperature may fluctuate slightly. Q1. Look at the trace showing pure water. By looking at the changes in gradient of the graph, see if you can identify the regions of the graph described below. For each region fill in the time and the temperature at the start of this region. Q2. Before the pure water begins to freeze, the temperature drops rapidly. Once it begins to freeze the temperature remains fairly constant. Explain why. Q3. At what temperature did the salt water begin to freeze. Why is this lower than for the pure water. Q4. Identify the sections of the graph that show the freezing of the pure and salt waters. The pure water shows a fairly flat region whilst the salt water has a gentle slope. Explain why. (Hint - more salt can be dissolved in warm water). Q5. If you look carefully at the region where freezing starts you may notice a small ‘blip’ where the temperature actually increased for a short period. Why did this happen. Q6. Think about what happens to the temperatures of the two samples as they warm back up to room temperature. Sketch a graph of temperature against time showing what you think will happen. How might the purity of the water effect the shape of the graph? How would the concentration of salt effect the results? What results would you expect if the samples had been boiled rather than frozen? Use the results to estimate the latent heat of freezing (you will need to know the specific heat capacity of water).